This is probably Uuemõisa, right before Haapsalu. This interesting building is from the first republic. Such fog is very enjoyable to me. There isn't much of such weather. This should be local culture house. That one looks pretty good. Very nice and new brick to my eyes. "See that car plate?... What kind of owner is that?" And there you go, my camera had a wrong regime again. 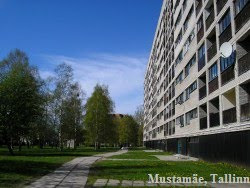 Very similar buildings are in Põlva.